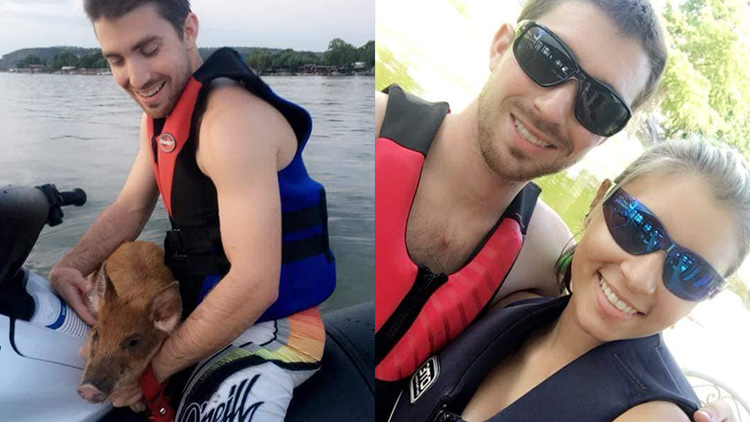 The couple said they spotted the pig, who they named Wilbur, trying to swim across the lake while they were jet skiing in Granite Shoals. GRANITE SHOALS, Texas — A baby pig has been rescued after it was spotted trying to swim across Lake LBJ. As the pig trekked across the lake, a local couple spotted it while they were out jet skiing Monday. The rescuers, Jordan Morris and Jerry Adair, said they thought the pig was a deer or dog at first because of its reddish color and big ears, but soon realized it was a small pig. Morris said she was glad she was able to help the pig make it to safety. "I’m a big animal lover and if I ever come across anything like that, I will definitely go out of my way to help," said Morris. Adair's mom shared the experience on Facebook. Morris said she and Adair named the pig Wilbur and returned it to dry land with other wild hogs.